M100-AR1 1 ph. aux powered true RMS sensing RMScal. The M100 series current transducers are designed to measure A.C. Current in single and 3phase systems. They convert the A.C. signal to a D.C. Output that is directlyproportional to the input signal. TheM100-AA1 AA3 are self powered (i.e. no auxiliary required) average sensing RMScalibrated current transducers, mA and voltage outputs are available. The M100-AL1 AL3 are average sensing RMScalibrated, live zero current transducers. 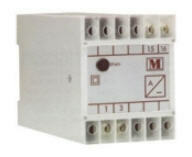 Auxiliary is required to provide power, so that4mA output signal is present, when the input is zero. The M100-AR1 is true RMS sensing RMS calibratedallowing measurement of distorted waveforms of up to 9th harmonic with a crest factor of5. The AR1 is typically used in current measurement where distorted waveform iscommon, such as thyristor drives. Theabove units are used to measure current in energy management systems,switchboards, generator and telemetery controls. Isolation of 4kV is providedbetween the input and output signal, allowing the output to be fed toconventional analogue meters, digital meters, PLC, and computer systems.